Nice, I was hoping someone would post a picture of this! I wish I had a closer-up view of the tanker in question. My understanding was that it sort of jack-knifed and blocked every freakin' lane going Northbound. So sucky for those other people. Well that makes it look like it's only blocking one lane. Why don't all of the other lanes keep going? my guess is that it was some sort of tanker and that spillage was involved. yeah. WSDOT says it's a tanker spill. 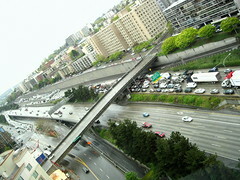 If you reload that metblogs page, I added another picture from WSDOT. They also have video of people walking around and looking at the highway. It's all very thrilling. Is that I-5? Because on my way home from work there was a horrible accident on the 405 headed southbound. It was awful, the guardrails on both sides of the 405 were demolished and I saw the car that was completely smashed. This was about 3 or so...and what was worse...was that it was on the other side of the freeway from me and yet we weren't moving either!